An average of 37 children per year die of heat stroke in Hot Cars in the U.S. These tragic deaths result from children accidentally locking themselves in vehicle cabins or trunks and by adults intentionally or accidentally leaving children in Hot Cars. Hot Car deaths can lead to criminal charges for the responsible adult. Fortunately, Hot Car deaths are also easily preventable. 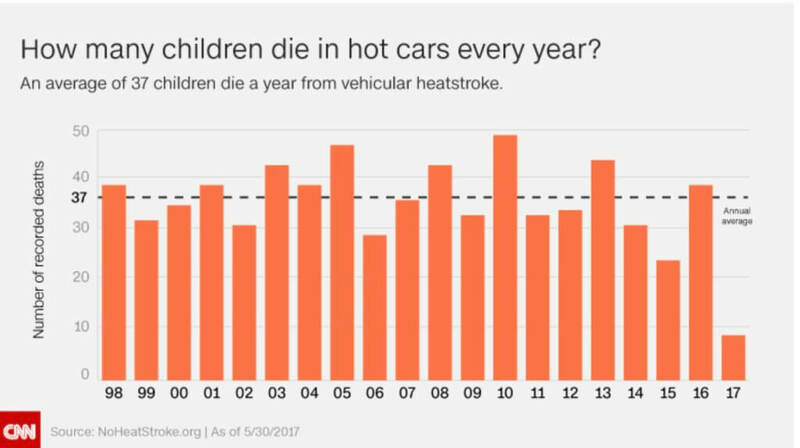 Why Do Children die in Hot Cars? Vehicles have a greenhouse type effect in which they can heat up to dangerous temperatures very quickly. On an 80 degree day, a car can heat up to 125 degrees in just minutes. 80 percent of the increase in temperature happens in the first 10 minutes. It may surprise you to learn that children have died from heatstroke in weather as cool as 60 degrees. Moreover, contrary to what you might expect, cracking car windows does NOT prevent the vehicle from heating up to deadly levels. A contributing factor to child injuries and deaths from heat stroke is that children overheat 3-5 times faster than adults. It is a dangerous phenomenon that most parents believe that they could never leave or forget their child in the car, but over 55% of Hot Car deaths are caused by caregivers. These cases in which children are accidentally left in the car usually involve a responsibile and loving parent who just makes a terrible inadvertent error. A common scenario is that the parent who doesn’t normally drive the child to day care is called into action in an emergency and then forgets the child because it is not part of his or her usual routine. Accidental Hot Car deaths have been caused by parents whom you would not expect to be easily distracted including a teacher, dentist, social worker, police officer, nurse and even a rocket scientist, so it can happen to anyone. Four Tips to Prevent Hot Car Deaths? 1- Never Ever leave a child alone in a car – Even if you think you are going to just be gone a minute, anything can happen when you leave a child alone. You could get hurt or distracted and your child could be trapped with the heat rising dangerously. By the way, in Pennsylvania, Delaware and Maryland it is ILLEGAL to leave your child alone in the car. 2- If you see a child alone in the car don’t ignore it – Get involved and save a life. Call 911. Make sure that the child is rescued. 3- Keep your vehicle locked and keys secure – Prevent children from getting injured or killed by playing in the car cabin or trunk by keeping your car locked and your keys secure. 4- Have a plan to avoid accidentally leaving your child in the car – Just when you think it could never happen to you or your family, you might accidentally leave your child in the car. People get stressed and distracted. Even something as critical as the safety of your child can be overlooked. So, plan ahead to avoid tragedy. Store something essential in the back seat where your child is – like your purse, wallet, briefcase, cell phone or employee badge. Have a strict policy with your daycare that if the child does not arrive on time both parents must be contacted immediately. Consider using car seat sensor devices that will notify you if you accidentally leave a child in the car like Sense-a-Life and iBabyseat. 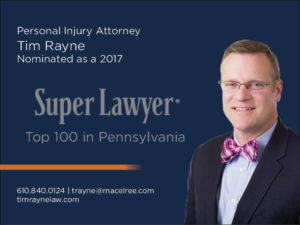 About the Author – Tim Rayne is a Car Accident and Personal Injury Lawyer with the law firm MacElree Harvey, Ltd. For over 20 years, Tim has been helping injured victims of accidents and their families receive fair treatment from insurance companies. In addition, Tim regularly pubishes articles and videos on Safety and Insurance issues to prevent accidents and protect people when accidents occur. Tim has offices in Kennett Square and West Chester, Pennsylvania. Contact Tim Rayne at 6108400124 or [email protected] or check out Tim’s website, timraynelaw.com.